The San Miguel School is not tuition-driven. Our mission is to serve students most in need and the tuition paid by families covers less than 6% of the school’s annual operating budget. Student sponsorship covers the operational expenses typically offset by tuition in most private, independent schools. Sponsoring a student helps to close the gap between what parents and families are able to pay and the cost of an educational experience that turns lives around. A suggested sponsorship commitment of $8,900 annually for four years (or $4,450 for a partial sponsorship) is a transformational gift in a young boy's life. Our Student Sponsors are individuals, foundations, families, and businesses that choose to make a life-changing gift directly linked to the education of one of our students. The full cost of educating a student at The San Miguel School is nearly $16,000 per year, including extended-day activities. In addition to a student sponsorship, the financial package covering student tuition includes the contribution from parents/families, which is based on their ability to pay (usually 3-5% of the cost), and may include a scholarship from donations to STEPS through the RI Scholarship Tax Credit Program. Other private fundraising efforts, including the school's Annual Fund, and special events supporting the Scholarship Fund, are used to make up the remaining difference. A sponsorship directly links a student to a donor. As a Student Sponsor, you will learn about your sponsored student. Through letters and invitations to special recognition programs, you will stay informed about his achievements and the future aspirations of the young man whose education is sponsored by your generous gift. To learn more about becoming a Student Sponsor, contact us at (401) 467-9777 X117. You may make a Credit Card gift (Visa, Mastercard or Discover) online, or by calling us at (401) 467-9777 x115. Please contact us at (401) 467-9777 x117 to let us know if you are making a gift of stock. You may also designate The San Miguel School to receive a donation through your gift to the CFC (Combined Federal Campaign). Many employers offer a matching gift program. Please check with your human resources department and forward the required forms with your gift. You may also forward forms by fax at 401-785-4976. In-Kind gifts help us to respond to the needs of our students and families in ways that would not be possible otherwise. We are happy to talk with you about an in-kind gift you are considering. Please contact us at (401) 467-9777 x117. Remembering The San Miguel School in your estate planning will allow you to continue ‘touching hearts and minds' forever. The simplest way to make a gift is to include San Miguel as a beneficiary of your will or trust. Other Planned Giving opportunities include gifts of life insurance or retirement funds, or donation of stocks or securities. 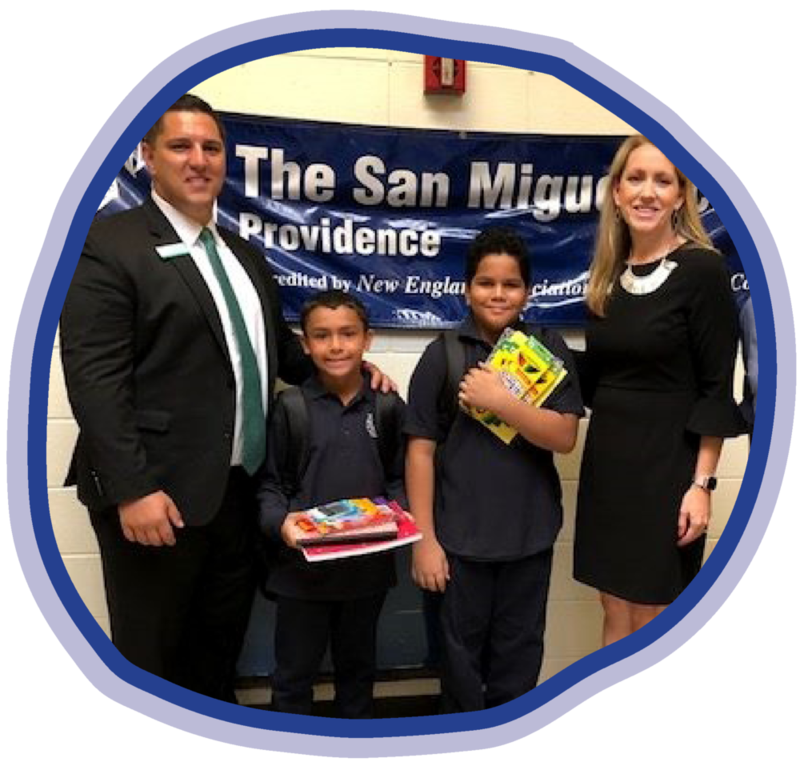 If you have already included The San Miguel School in your estate planning or have arranged to make any type of planned gift, please let us know so that we may thank you for your generosity and thoughtfulness. We provide family support through a variety of our programming. We want our families to know that we will uplift and support them.